When the first “Back to the Future” film was released in 1985, it seemed that our futuristic dreams and visions were finally coming to life. A time-traveling car was soon followed by the hoverboard and flying cars in “Back to the Future Part II.” What was once science fiction in comics and novels appeared a step closer once on the silver screen. As the real world passed the “D-day” of “Back to the Future II”—October 21, 2015—the cars we had been dreaming of since 1985 weren’t quite what we expected. Although the last 30 years didn’t give us the flying time machine of pop culture, we have still seen quite the shift toward “smarter” cars: they may not fly but they can drive themselves! With more realistic visions on the drawing board, just what will the next 10 years have to offer us? Self-driving vehicles are not a truly magnificent new concept, and the idea certainly didn’t stem from “Back to the Future.” With the famous Arabic folk tales in the classic book “One Thousand and One Nights” (also known as “Arabian Nights”) comes the portrayal of a magic flying carpet in the tale of “Aladdin’s Wonderful Lamp.” A vehicle, flying on its own? What magic! This wonderful sorcery, though, would centuries later become a reality with self-propelled rockets, missiles, the Mars rovers, drones, and now cars. In 1935, science fiction began to boom with the idea of a driverless car. At the 1939 New York World’s Fair, General Motors (GM) displayed their Futurama exhibit “Highways & Horizons.” This scale model of the imagined future world (the year 1960!) showcased automated highways in cities, countryside, and industrial areas. All with miniature driverless cars. The roads featured trench-like lanes to keep cars in their own tracks, letting you relax until it was time to exit. As David H. Keller wrote in 1935 in “The Living Machine,” “Old people began to cross the continent in their own cars. Young people found the driverless car admirable for petting. The blind for the first time were safe. Parents found they could more safely send their children to school in the new car than in the old cars with a chauffeur” (“Wonder Stories,” 1935). The idea of a driverless vehicle gave hopes of fewer accidents, less congestion, and even cities relieved of a need for most parking; a hope still sanctioned by designers of today’s tech and auto worlds. By the 1950s, the vision for self-driving cars was still marrying practicality with fantasy. Just look at images of early concept ideas of the “future car.” Some would call them outlandish and unrealistic. But my goodness, they were sleek, stunning and delicious to the eyes. GM’s Firebird III of 1958 shows retro fins and a shark-like front end. The car was said to have an electronic guiding system that would allow it to drive on an automatic highway without the driver ever touching the wheel. Around this time, GM were already testing their self-driving car on automated highways. As the 1960s got underway, new technology was advancing the idea of the driverless car, but it was used for smaller vehicles such as the 1966 machine Shakey. Stanford Research Institute’s (SRI) Artificial Intelligence Center developed this machine that navigated real-world environments. Shakey mainly stayed off roads, however, and remained indoors. 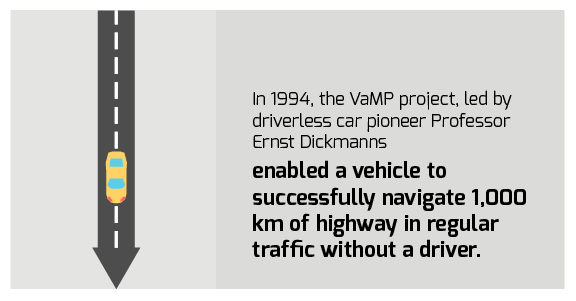 Still, the sensors and software SRI were using for Shakey were groundbreaking milestones in self-driving navigation. Not too much later, this technology was used as a platform for lunar rovers. The Stanford Cart was created as a research platform and was equipped with a video camera and remote control with a very long cable. The little buggy was a potential solution for controlling a moon rover all the way from Earth. Following the Shakey and Stanford Cart debuts, the UK Road Research Laboratory (RRL) began retrofitting cars with an electro-mechanical “auto-driver” system. This system merged features like the convenience of highway driving and the safety of railway travel. Slade Penoyre of RRL said in New Scientist and Science Journals that this new system would be 100 times more reliable than a human driver. By the time the 2000s hit, self-driving cars were beginning to use more than just cameras to drive. In 2004, DARPA conducted the first Grand Challenge for self-driving vehicles. In 2005, the Stanford Racing Team’s VW Touareg, named Stanley (equipped with more than just cameras), was able to complete the Mojave Desert course and won first place, with a prize of $2 million. Stanley’s gear included laser rangefinders, radar for long-range sight, GPS sensors, and several Pentium M motherboards in rugged rack mounts. Finally, in 2009 Google launched their own autonomous car research project. In the past they had backed DARPA challenges, but soon began their own testing and development. The Google cars, including a Toyota Prius, drove out on the streets of the Pacific coast and logged over 140,000 miles, by just 2010. The vehicles were supported by engineers, many of whom came from the 2005 and 2007 DARPA Challenge-winning teams. Google’s cars used radar, video, and lasers to navigate the roads autonomously. Not far behind, the VisLab team (they originally outfitted the ARGO vehicle with its camera system) embarked on an intercontinental autonomous challenge. The challenge included four autonomous cars that crossed nine different countries from Parma, Italy, to Shanghai, China, and covered over 13,000 miles. The vehicles faced numerous everyday-driving conditions and had onboard navigational systems that were solar powered. These systems proved to be sustainable add-ons to existing vehicles. The only hiccup was an accident in Russia that was due to human error, and the car almost logged the first record of an autonomous vehicle getting a traffic ticket! Google has continued to lead the driverless car game, but many car companies themselves have begun to include new tech in their newer models, turning cars into “smarter” vehicles, even with a human behind the wheel. You can actually buy a self-driving car today, the Navia—at $250,000 though. The Navia is designed to shuttle passengers on closed environments like campuses or golf courses and won’t go over 12 mph. There are also self-driving “pods” at London’s Heathrow Airport. 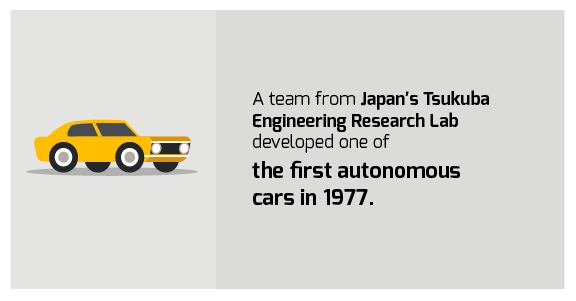 Nissan has also had success in creating the first self-driving cars permitted on Japanese roads. These vehicles have driven many dignitaries including Prime Minister Shinzo Abe. Some of the first mockups of “the future car” were a beautiful mix of science fiction and fantasy. We’ve seen that with GM’s Firebirds. Fifty years ago, they were quite similar to the “Back to the Future”-famous DeLorean, with its vertically rising doors. Many others sported cartoon-like sleek lines and even glass doors. Today, concept cars created for the future seem to resemble the Batmobile more than anything. Smooth lines might have felt too “old school” for some, and the look of “The Jetsons” was tossed to the bin and replaced with the superhero, supercharged, supercar look. Concept cars have also taken on more of a “Tron: Legacy” look, like the Taihoo 2046 Concept Car. But, the actual vehicles we are driving today won’t be changing all that much in the next couple of decades. As designers have begun to rely more on practicality and the idea that the future cars of 2025 may not be flying, and very few will be driving themselves, the real cars of the future won’t look much different to the cars of today. Most changes will be coming in the form of holographic info displays, car-to-car communication and car-to-X communication (cars being able to communicate with other surroundings such as buildings, traffic lights, etc., not just other vehicles), advanced cruise control systems, blind-spot monitors, 360-degree cameras (for reversing and parallel parking), night vision, airbag developments, battery charging improvements, aerodynamics, and more advanced materials. 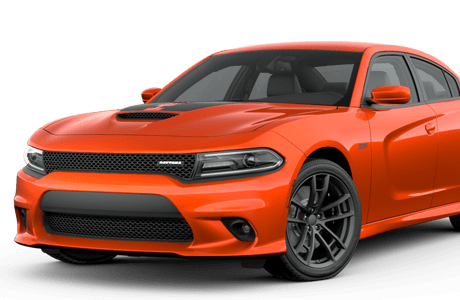 Many car companies have also been focusing on lighter materials (such as magnesium, aluminum and carbon fiber) and downsizing engines. Audi have already shown that this could help fuel economy. What we see in 2025 could be “smarter” cars, just probably not flying ones. Sorry, McFly, and “Back to the Future” fans. The technology behind the self-driving car was most likely born out of the self-propelled torpedoes that came about in the late 19th century. The first self-propelled torpedo, developed by Robert Whitehead in the 1860s, had a very simple guidance system, one that kept it on a constant course and at a steady depth. By the time World War II was underway, torpedoes had the ability to hone in on their targets using sonar. 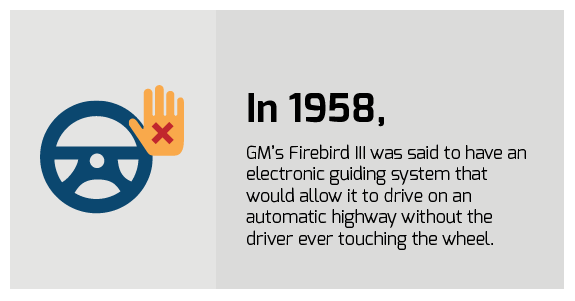 GM’s Firebirds used buried cables that sent electronic impulses to the car’s onboard receivers. This would require tons of cable embedded into the streets, however. In the later 1900s came self-driving cars that used cameras to detect the white lines on streets and then guide the cars along the road. Though it may seem primitive, the cameras proved successful. Google’s Toyota Priuses and modified Lexus SUVs (and other new prototype vehicles) have combined the camera technology of the first autonomous vehicles with data from Google Street View, LIDAR surveying technology, and radar to determine the car’s position on a specific map. So far, this system has proved a true success. The vehicles have been able to negotiate San Francisco’s Lombard Street with its eight hairpin turns on just one go. They have also circumnavigated Lake Tahoe and have driven from Mountain View to Santa Monica, California. The sensors in the Priuses can detect objects that are two football field-lengths away, even including shopping bags and the one or two daring, road-crossing ducks. The self-driving car technology used in Google’s cars has begun to rely more on coding and computing, rather than just the cameras of decades ago. The great thing about self-driving cars is that their technology is really just combining many different forms that we are already aware of and familiar with: sensors, cameras, radar, and even Google Street View. Though Google may be getting much of the spotlight for self-driving cars, they certainly aren’t the only ones with their foot in the pond. As the slogan of Mercedes-Benz goes, it’s “the best or nothing,” and you better believe that “the best” are certainly taking on inspiration from the Doc of “Back to the Future,” and creating what could be more than just an autonomous car: it could be complete luxury. On October 15, 2015, Mercedes-Benz released their own tribute to the Doc and showed us what their version of the future could be. Complete with a hoverboard and robot dog walker came Mercedes-Benz’s design of a luxury autonomous vehicle. And boy, was it beautiful. But that is just it; the hope with autonomous cars is to live life a bit more luxuriously—relax with a book in hand as your car takes you where you need to go. Move from work to soccer practice to afternoon tea to date night or the club, all without lifting a finger. The autonomous car could bring luxury to any family or individual, and Mercedes-Benz really showed us just that. 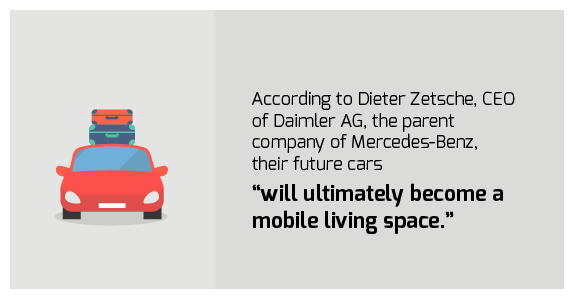 According to Dieter Zetsche, CEO of Daimler AG, the parent company of Mercedes-Benz, their future cars “will ultimately become a mobile living space.” But they certainly aren’t the only ones combining luxury with necessity. Bentley, Tesla, BMW and many more have already started shifting towards the autonomous vehicle, and some actually have semi-autonomous cars already on the road today. With higher-end car companies heading the autonomous car push, it certainly seems possible that autonomous and luxury will soon become synonymous. As we’ve seen, there are several car companies out there already pushing toward a marketable self-driving model. Some have already begun to test their models. While the cars are not completely autonomous just yet, companies like Google, Toyota, Lexus, Mercedes-Benz, Tesla, Delphi, Audi, Nissan, Bosch and BMW have been testing partially autonomous vehicles. 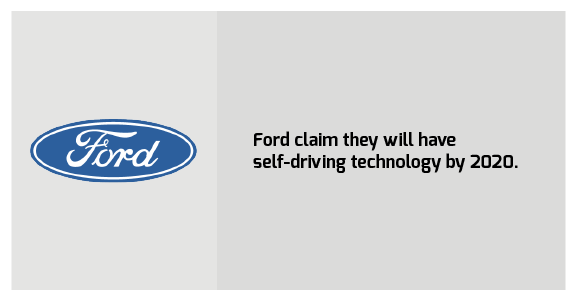 Oh, and be sure that these aren’t the only self-driving car companies out there. More and more corporations are diving into the game not wanting to lose out or be left behind. But does this mean that it will ever be affordable for the average driver out there? 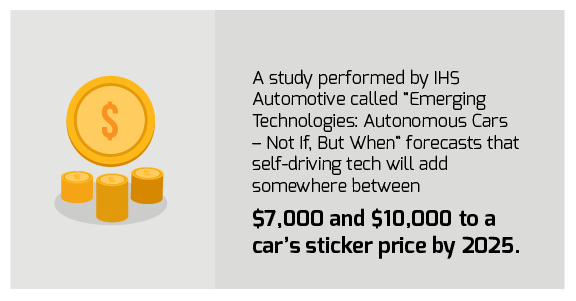 But When” forecasts that self-driving tech will add somewhere between $7,000 and $10,000 to a car’s sticker price by 2025. Potentially, that number will drop to about $3,000 in 2035, but will that still be affordable? Although self-driving car costs look steep at this time, there is great potential as the cars become more in-demand, and as more car companies try to approach the market pragmatically. Still, it may not be many more decades before Siri is asking you if you would like to switch to autopilot as you head across the country.